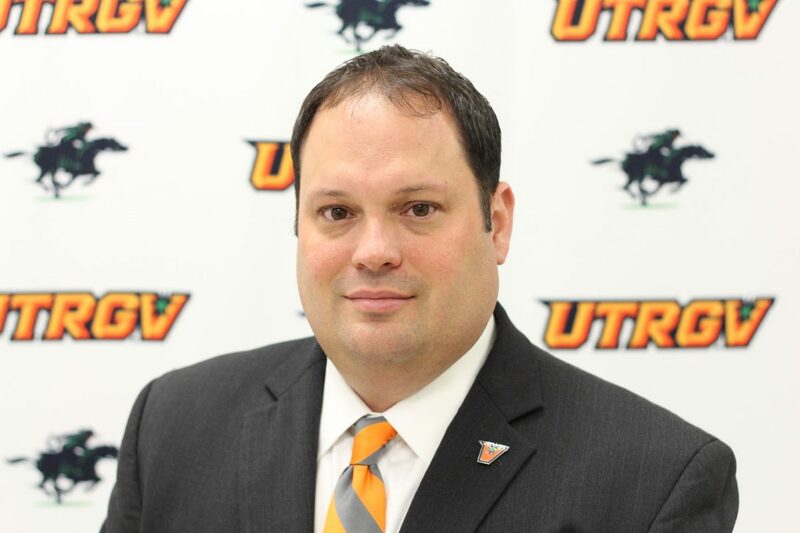 EDINBURG — Since Chris King took over as UTRGV director of athletics in 2009, the department has doubled its staff and tripled its budget. Reflecting on his tenure to this point, King can point to improvements in almost all of his goal areas: academics, competition, facilities, fundraising and capital projects, among others. His efforts were formally recognized on a national scale Monday, as King was named one of four winners of the Under Armour AD of the Year Award in Division I-AAA by the National Association of Collegiate Directors of Athletics. The award “highlights the efforts of athletics directors at all levels for their commitment and positive contributions to student-athletes, campuses and their surrounding communities,” according to the NACDA release. Also winning in Division I-AAA were Greg Christopher of Xavier University, Lenny Kaplan of the New Jersey Institute of Technology, and Scott Lazenby of Texas A&M Corpus Christi. King facilitated UTRGV’s move to the WAC beginning with the 2013-14 seasons, and UTRGV has since won two team and 16 individual WAC Championships. The program’s sport offerings have grown during his tenure with the addition of men’s soccer in 2015 and women’s soccer in 2014. But King is much more eager to focus on what UTRGV’s student-athletes have accomplished off the field. The department posted a cumulative GPA of 3.14 in 2016-17, up from 2.84 when King started, he said. In the past eight years, the graduation success rate for student-athletes has improved from 54 to 77 percent, and a record 152 student-athletes made the 2017 Fall Athletic Director’s Honor Roll by posting a GPA of 3.0 or higher. The department has also greatly enhanced its community service efforts. UTRGV completed the 15th-most community service hours in Division I in 2015-16, then set an all-time department record for service in 2016-17. Last fall, UTRGV athletics performed 507 hours of service. Every UTRGV athletics facility has been renovated since King took over, he said. The UTRGV Fieldhouse has undergone a set of renovations, including the installation of a new video board. UTRGV Baseball Stadium has seen significant improvements since being acquired from the city of Edinburg in 2014, the Orville Cox Tennis Center has been upgraded, and the department has moved into a new strength and conditioning facility. During the 2016-17 academic year, UTRGV unveiled the Coach Al and Joann Ogletree Plaza outside the UTRGV Baseball Stadium and enhanced the Victory Center — an outlet for student-athlete academic support. The department also completed the $4.55 million UTRGV Soccer and Track & Field Complex in 2014, which King said was the first new build in 30 years for UTRGV athletics. Many of the projects were enabled in part by the department’s improved fundraising efforts. Overall fundraising increased by 198 percent in 2015-16, and corporate sponsorship grew 157 percent. Ticket revenue jumped 44.67 percent in 2016-17, and in June 2017 King secured a $1 million planned gift from Dan and Terry Martinez. More projects remain on the horizon, King said, with the UTRGV Fieldhouse set to begin the first phase of a two-part renovation in the coming weeks. King also said the department is in the process of arranging a public-private partnership to build a new tennis facility about a mile from campus. King has long expressed the desire to see UTRGV field a football team, and the department took the first steps that direction with the announcement of a feasibility study in June 2016.